Among the many surprises that have come from Chinese toy factories in recent years has been the rise of Feng Jia Toys. Unlike other blaster-building companies (Zecong comes to mind), Feng Jia tends to actually produce unique blasters. Even the blasters with obvious origins tend to have their own personalities. While the actual blaster names seem to change depending on color scheme and translation, their “roles” are consistent. As such, I will refer to this blaster as the Sniper Rifle. 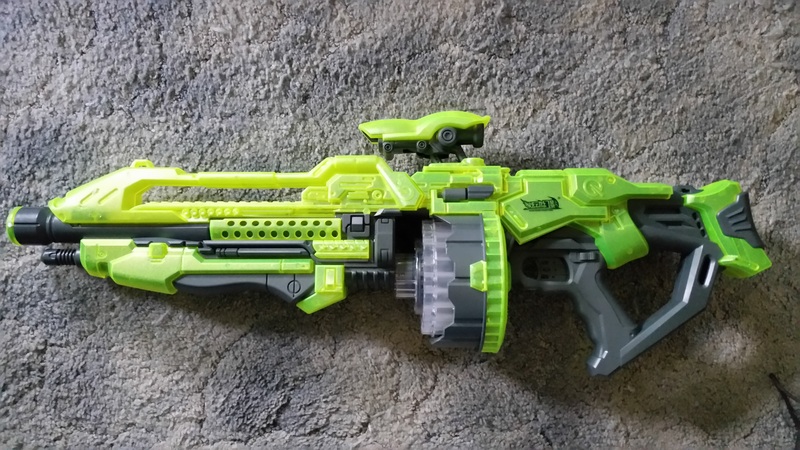 The price is high, but the blaster is unique and works well. I acquired the translucent green Feng Jia model, which comes with glow in the dark darts and an illuminated dart turret. The fake scope at the top flips between raised and lowered positions. The grips both in front and back are spacious. 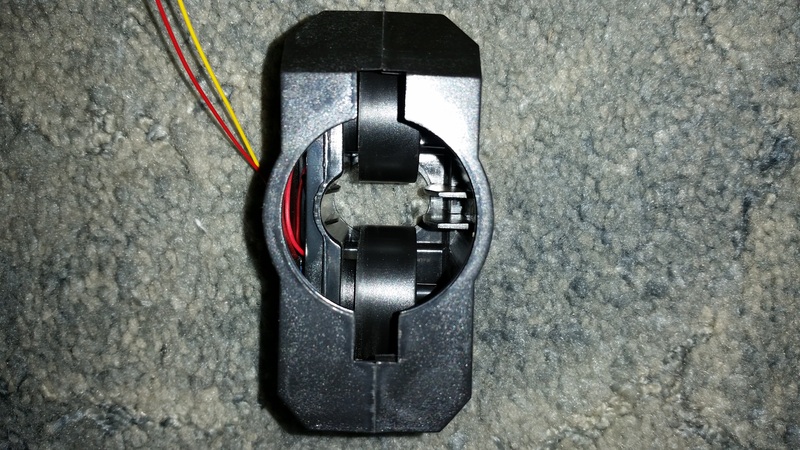 The on/off switch sits just above the rear grip, but there’s no rev trigger of which to speak. Finally, the turret is made of completely clear plastic. Why clear? 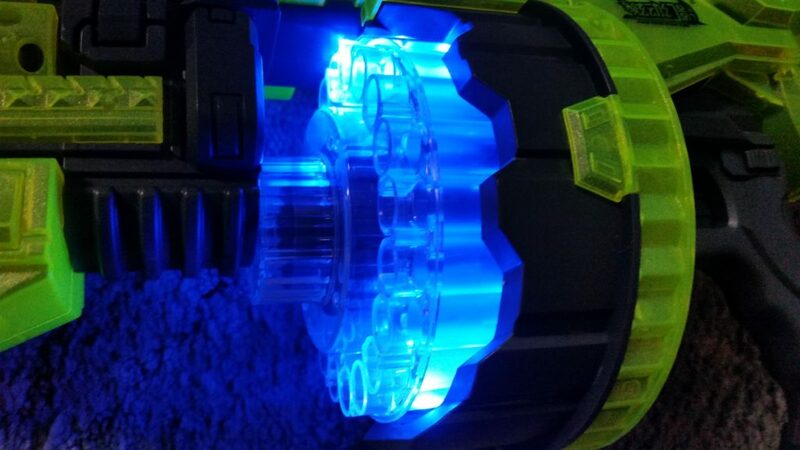 It turns out there are two sets of LEDs sitting above and below the dart turret. The blue glow is quite pretty, and meshes well with the alien vibe of the blaster. It’s visible in daylight, but it’s really bright in the dark. 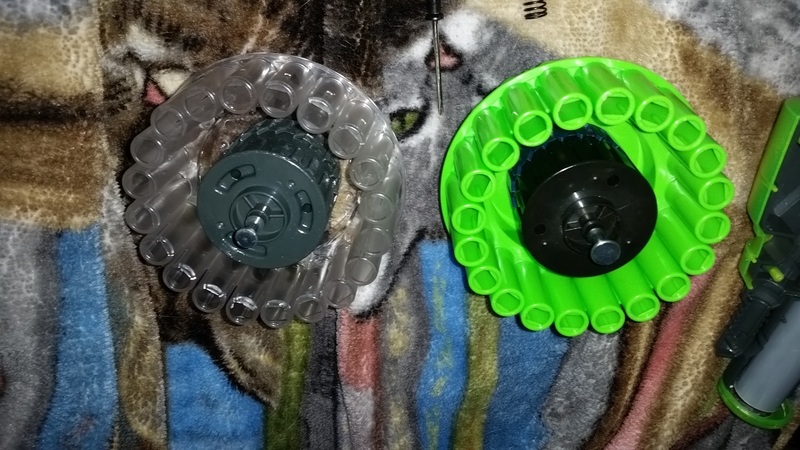 If the turret looks familiar, it’s because it’s virtually the EXACT same mold as the turret from the Buzz Bee Mech Tommy 20 and Automatic Tommy 20. In fact, if you wanted to swap turrets with the Buzz Bee, you could. There’s no reason to do that, though, unless you really want to be a special snowflake. The NiMH battery pack (four AA-sized cells for 4.8V) has its own plug sitting in the back, and it rests in the battery tray slot. 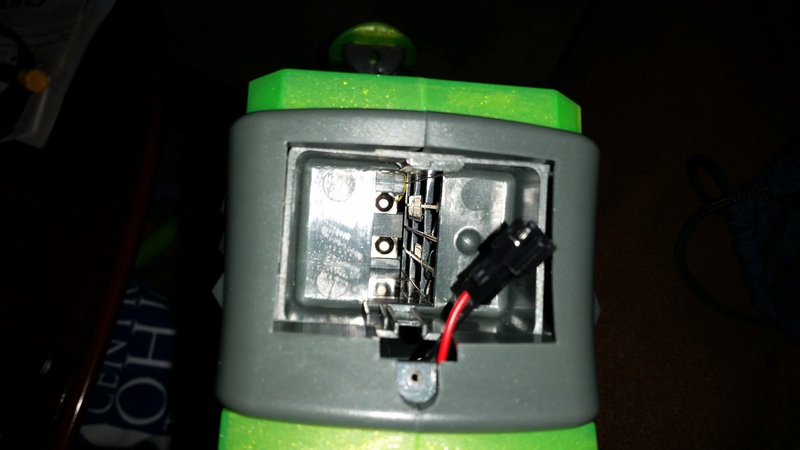 If you have another Feng Jia electric blaster, you’ll see that the battery trays are all interchangeable, and the tray still fits here! The spring contacts present in the others aren’t soldered into the metal tabs as they are here. I added my own so that I could use either a rechargeable pack or whatever AA batteries I had available. Eventually I will replace the entire section of the shell with a LiPo battery. 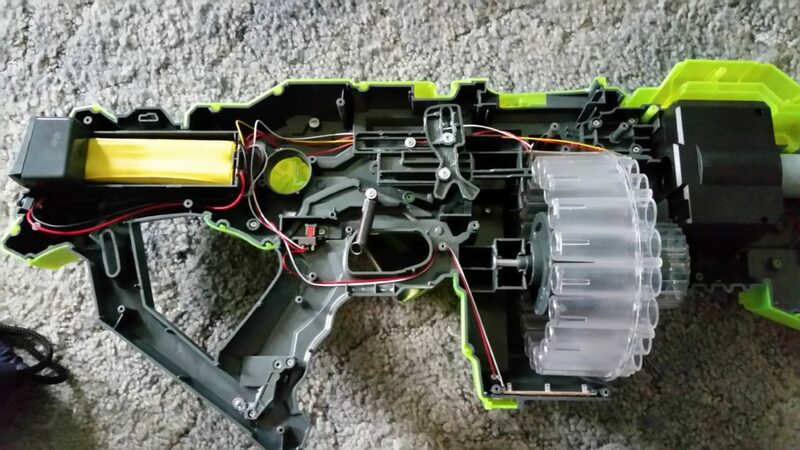 When you open up the blaster, you can see the pusher mechanism. 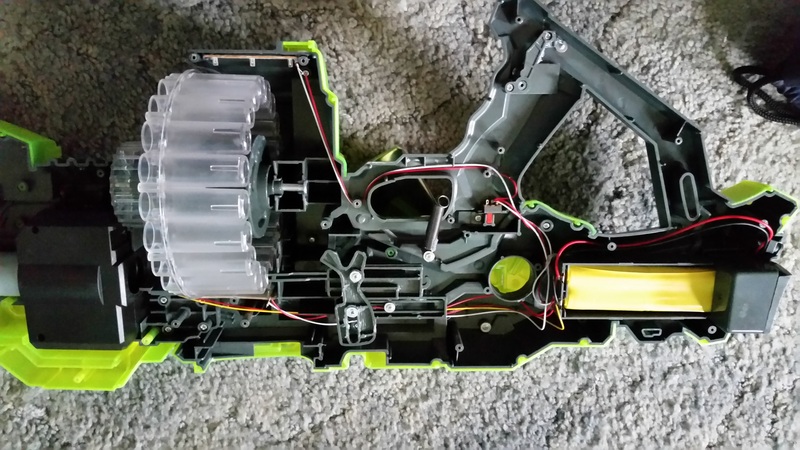 The power switch on the side of the blaster blocks the trigger from being pulled. If you look closely, the wires being used are TINY. In addition, all the current being used must pass through that tiny switch. If the wire from the switch ran to a MOSFET or a relay, that would be one thing. In any case, wire replacement will help stock NiMH-powered performance, and would be essential for any form of overhaul. The motor cage is rather large! The blaster still uses regular 130 size motors, though. The flywheels are smooth and large. Their spacing is slightly farther apart than you would find in a Nerf Stryfe or Rapidstrike. However, it’s less than that of the Buzz Bee Brute. I imagine that it’s tailored to the darts that shipped with the blaster. Standard Elite darts will still work, as do other brands of foam darts. There’s nothing complicated about the wiring. 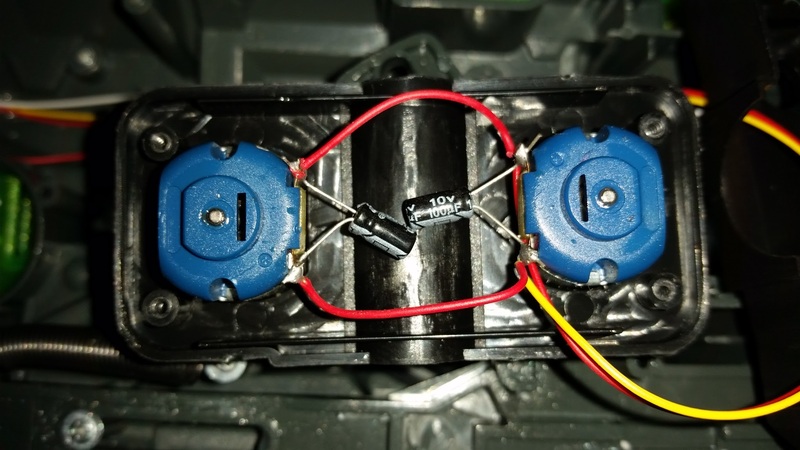 Each motor has a small capacitor running in parallel. They help reduce the electrical noise coming off of the motors. Since you have spinning magnets in there causing the current to rise and fall, the variance can result in electromagnetic waves being generated. For small circuits there isn’t much of a concern, but with higher current loads and/or long runs of wire (which can act as an antenna), these help reduce the radio interference. Performance of the Feng Jia Cyber Hunter Sniper Rifle is excellent for a stock blaster. Darts velocities tend to hover around 70 FPS when exiting the muzzle, and ranges averaging 65′ (angled) are typical. Rapid firing does diminish range due to the motors not having time to come back up to speed. Even then, it only takes about a second between shots to keep darts going a fair distance. 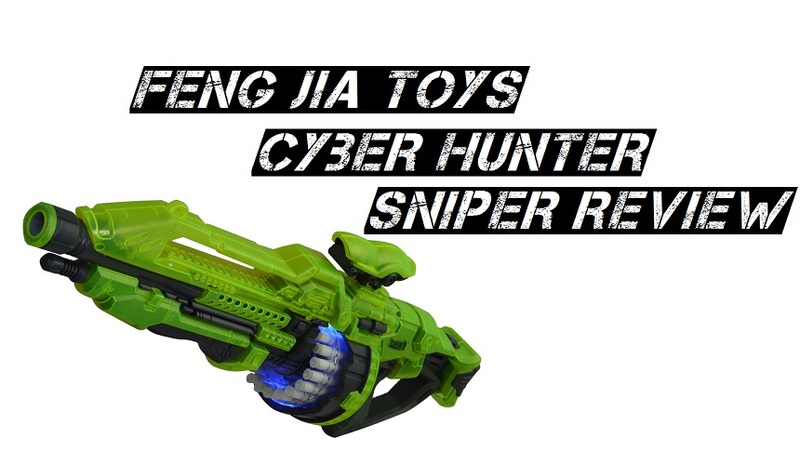 The Feng Jia Cyber Hunter Sniper Rifle has an out-of-this-world design, and great ranges. Until recently, these blasters had to be shipped from overseas. However, you can now find several Feng Jia blasters at Academy Sports, being distributed under the “World Tech Toys” brand. Both the red and green versions of this blaster are available for $50. It’s pricey, but for such a large and unique blaster, it could be justified. This entry was posted in Dart Blasters, Reviews and tagged blaster, Feng Jia, review on November 11, 2016 by BuffdaddyNerf. These seem to be pretty widely available. I snagged the $20 Renegade. Seems fun. I like the asthetics.